Fiction and non fiction. The Words in my Hand was a lovely read, set in mid 17th century, Netherlands. It is a fictionalised account of French philosopher and mathematician, Descartes and his relationship with a young woman. Beautifully written, you can almost imagine yourself there. Code Girls is about the unknown American women who were code breakers during the wars. A really interesting read so far. Lemon Squeezy Slice - recipe here. I made mine in an 18cm x 30 cm tin, not the 20cm x 20cm tin recommended - I think the icing to base ratio was just perfect this way. I know I said I wasn't going to work on my AMH quilt, but I had a brainwave for the backing while trying to sleep the other night, so the fabrics have come out again, and cutting has commenced. I cleaned up my sewing room on Saturday, which meant that I felt inspired to sew. Because I had room on my cutting table for pressing a lot of seams, and laying out strips of blocks, and pinning strips of blocks to quilt halves, a lot more sewing was done. Which then leads to my big show off moment - I have finished my AMH quilt - well make that the quilt top. It measures approximately 60" square. 1 x 5" square, and then two strips of solid 1 x 5"x 1.5" and 1 x 6" x 1.5". This will be carefully put away for now, and the more subdued Seaglass Sampler Quilt pulled out and worked on, I'm aiming to get this turned into a completed quilt top by the end of the year. Meeka thinks any quilt is for her. My sister Janine's Bird Dance Quilt. On Wednesday last week, I received a parcel at work. Lots of happy jumpy claps followed. It was my Bird Dance Quilt returning from being quilted by Leanne otherwise known as Quiltmekiwi. Leanne also quilted my sister's Bird Dance quilt, so I knew she would do a beautiful job. Every bird block has been quilted differently using Leeanne's free range doodling skills. The birds just POP. My quilt differed from my sister's, in that I omitted the berries that were appliqued and embellished on the border, so I asked Leanne to do feathery flourishy quilting on that. Batting is a wool/poly blend provided by Leeanne. The backing was a fabric from Laura Gunn's Cosmos Collection, and because I had plain borders, I felt that I could get away with a bright multicoloured binding so used a Philip Jacobs print called Tree fungi which picked up a lot of the colours. The last photos shows both my sister's and my Bird Dance quilt, completed in colours and styles that are individual to us. Now we're trying to decide on a project for next year, the cushion I had originally picked has fallen off the want to make list. Under the watchful gaze of Meeka, sewing has commenced on my AMH quilt - I really need to think of a name for it. (I mentioned that to my kids, and Mr J, being the funny guy suggested Jenny - there's always one in a family). I had a minor disaster the other evening, I came home to find that my design sheet had fallen off the wall, the pins had come out and all my carefully placed blocks had fallen everywhere. Luckily Meeka was outside, so I couldn't blame her. Yes I had a photo of them all laid out in my previous post, but I had reshuffled a lot since then, and not taken another photo. Sigh! I laid it out on the floor this time, put them back into a semblance of order and then labelled and clipped the rows together ready for sewing. Hopefully I have the colours fairly evenly spread out, every time I look at it I want to change things. Since taking this WIP photo, I notice I have the same fabric in two colour ways next to each other - guess I need to decide if it really bothers me and unpick and replace it, or just keep sewing and finish it. There are not a lot of flowers blooming in my garden at present, one old spring faithful though, is my Corydalis Blackberry Wine - I love the fresh green leaves and mauve flowers, although I have never been able to smell the fragrant scent it is supposed to have. Eating // Home made chocolate chip cookies, chocolate cake, the joy of having Miss B and Mr J do the baking in the school holidays. Drinking // Water, earl grey tea and hot chocolate. Pampered, I spoiled myself and bought a beautiful new hand cream and shower cream. Excited, cos my Bird Dance is being quilted at present - see here for a sneak peak. Dreaming // of what I'm going to plant in the flower and vegetable gardens this coming weekend. Linking to Here & Now at Say Little Hen. 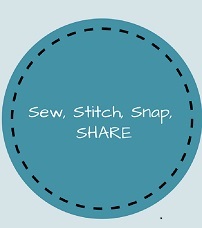 This weeks Sew Stitch Snap Share from me is all about the stitch. I have been very good and actually completed both the swans I needed to for my Christmas decoration exchange with my sister. We are doing mmmcrafts: 12 Days of Christmas ornament collection, I make the odds, she make the evens. We both make two each, so at the end we will each have a full set. Every year I put off doing these, thinking they'll take a long time to do. In reality they are quick and fun to make. Admittedly the neck was a little faffy to stuff, and there is a reason you are told to prewash your felt before soaking off the sulky fabric solvy. They are starting to get trickier now with people and clothes to make in the last four patterns to be released. These swans just need to be threaded for hanging, and one of them packaged up for my sister ( I think she'll get the pale pink one). Saint Andrea Corsini c1630 by Geurcino. Bullet holes courtesy of a soldier in 1944. We had a wind free day, so I managed to get a group shot of all 32 Ice Cream Soda Blossoms. Tin Man by Sarah Winman, a charming bittersweet novel of love, life and friendship, that's easy to read. My lemon tree is just covered in clusters of buds, they'll be opening properly and perfuming the air soon. Looking forward to lots of lemons for baking and summer G & Ts. Miss B and I went into the city, to see The Corsini Collection at Auckland Art Gallery. Beautiful portraits and pictures from the Corsini Family focusing on the Renaissance times. The colours and workmanship was amazing, as were the personal family stories relating to the portraits. Many of the frames were just as impressive. Hoping you have all had a lovely weekend and have a fabulous week ahead.